Text your mother (or father or grandparent or guardian) the most recent photo of you in the air, without comment. Report back here with her (or his or their) response. “How cool, your clothes are pretty warm/comfy. Kisses”. Translated from Portuguese. Also, I live in Florida. 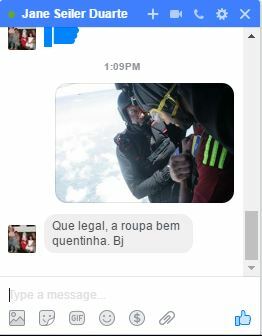 And wait, “Bj” means “kisses” in Portuguese?!? Poor Joe’s mom, let’s hope she feels better now!